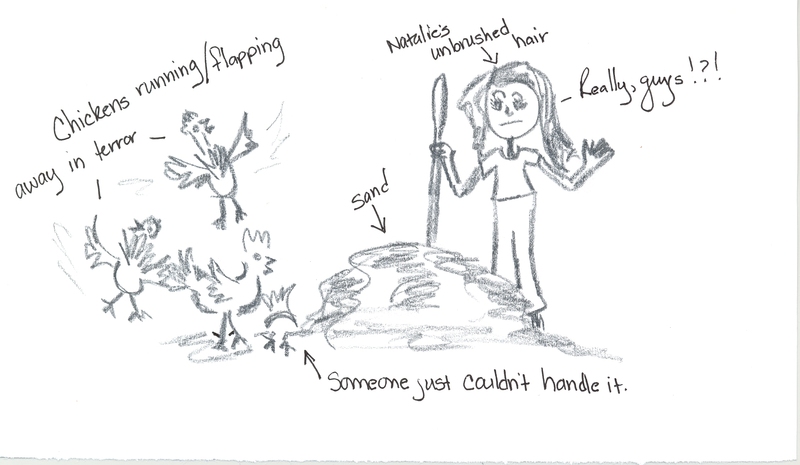 As a chicken keeper, I’ve learned chickens don’t handle change that well. It’s one of those things, like flock integration, that just takes time. Recently we’ve had a lot of rain, resulting in a soppy chicken pasture and a soppy chicken run. In an effort to remedy this pile of muck, I thought a change in the run flooring was in order. Well, over the weekend (while planting 3,000 trees ….with lots of family help….at Stephen’s grandmother’s home in the sandhills of SC) I came up with a genius idea that I knew would be perfect. We would simply take several boxes of sand back home with us! So in went the sand, in one big, happy pile…..just waiting for chickens to come scratch, wallow, and play. The chickens approached and stopped at the door. No one went any further. They backed away wary. Not even their favorite treat could bring them close to the pile of sand. The chickens were terrified. The floor was different. The poor chickens didn’t know what to do! Eventually nighttime arrived, and none of the chickens could bring themselves to walk past the pile of sand to get in the coop. Stephen and I caved, and we walked down to the coop and helped each chicken past the sand and into the house where they sleepily went to roost. My guess is that they’ll have to figure out what to do with the sand tomorrow. Like people, chickens apparently need time to adjust to big changes, sand being a “big change” in the eyes of chickens. That is funny about the cows! It’s almost like the power of suggestion. If you ever get chickens you will fall in love with them 🙂 Take the plunge! I have a husband like that. He resists change at every turn. I learned about 25 years ago (five years into this) that if I need to rearrange the living room, dig a new flower bed, change the curtains in the bedroom, that it went much more smoothly for everyone, if I just waited for a time when he was not home, made the change, and prepared for the questions upon his return. 99.9% of the time, within a week he’s thrilled with the change and telling any visitors to our home, that the change was his idea. But if I make the mistake of asking does he want to change something, the answer is no 100% of the time. Give the chickens a week 🙂 I’m 99.9% sure they’ll LOVE that sand! haha Stephen can be that way occasionally too! Chickens are currently loving the sand 🙂 Hope to see you Saturday!